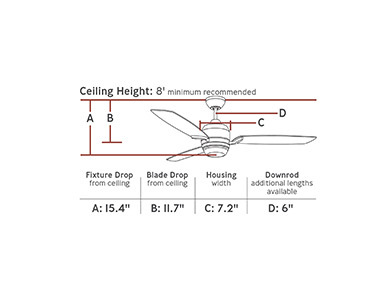 The modern silhouette of the 52" Muirfield three-blade ceiling fan by Monte Carlo makes a bold, contemporary statement. The subtle curves of the housing are highlighted in either our Roman Bronze or Polished Nickel finishes – which create wholly different looks. Complementing its clean lines is an integrated downlight encased in Matte White Opal glass, which comes with a 100W halogen bulb included. A two-in-one remote (combo hand-held and wall mount) is included which offers three-speeds and downlight control. Includes Wall / Hand Remote with downlight.